The ant pictured was later cleared of all charges. 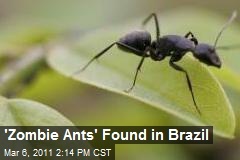 A lot of fuss is being made in the media about a parasite that supposedly creates zombie ants. With zombie fanatics on full alert I thought I’d try to explain some of the real science behind it in this blog. The parasite to which they are referring is the extremely difficult to say & spell, Ophiocordyceps unilateralis. It is a parasitic fungus. Parasites are living organisms that use other organisms as hosts. They can be single celled or large enough to see with the naked eye. Countless horrible diseases are caused as a result of them. O.unilateralis so far affects only ants. This is perhaps the first blow to it making zombies of us humans. Spores infect an ant and the fungus starts to take hold in less than a week. The ant will then begin to exhibit behavioural changes as the fungus exerts control of its brain. It departs its regular home and makes for a specific part of the jungle canopy. This humid spot is coincidently the perfect climate for its new host to grow. Once there our unfortunate ant is forced to bite into a leaf with a final death grip and dies. Its mission now accomplished the rather gruesome spike shaped fungus spawns out the back of the deceased ant’s head and proceeding to blast out spores ensuring its fungal family live on to infect another day. What do you call an ant with a parasitic fungus growing out of it's head? Dead. Whilst its ability to change the ant’s behaviour and guide it to such a specific spot is fascinating it does not actually compare all that much with Zombieism. Even if you were to encounter an army of millions of these ants they would not pose any kind of threat to you. No matter how many of them spoke with Sylvester Stallone’s voice. You are not the leafy luxury land in which the fungus is seeking to reproduce. The ants will not bite you making you join them in their unholy quest. While Sylvester Stallone's character in Antz demonstrated no zombie like symptoms the man himself is a different matter. Even if this nasty parasite could infect us humans it doesn’t really demonstrate any of the symptoms associated with the Zombieism condition. It does give us some change in personality aspects certainly but as yet we’ve never encountered a zombie that reproduced by toppling forward and sprouting a giant mushroom out of its head. No doubt the media attention given to O.unilateraliswill this year will furnish us with that in the near future, and in 3D I’d imagine. 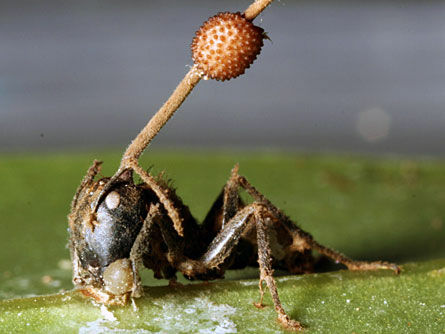 Ultimately Ophiocordyceps unilateralis does not create zombie ants but rather possessed ones. Furthermore this kind of parasitic manipulation has not been seen in humans at present. The media regularly use the zombie card to attract the attention of readers. A practice I cannot condone. On a side note Ophiocordyceps unilateralis, parasites and more are covered in Zombie Science 1Z the textbook available on Amazon now.